You probably spend time in front of a monitor every day, so if you're shopping for a new one, you want information that helps you make the best choice. This guide makes it easy to learn about your options. From types of displays to key features and specs, we'll explain what you need to know. How are you planning to use your monitor? Answer that question, and you'll be well on your way to finding one that's perfect for you. For tasks like email, social media, surfing the web and paying bills online, you probably don't need a high-performance monitor with lots of extra features. Many lower-priced monitors are available, and you don't have to settle for a small screen. Even average-sized monitors (23"–24") with Full HD are probably more affordable than you think. Monitors for multipurpose use provide the display quality and performance you need for everyday activities, like streaming music and movies, sharing photos and slideshows, videoconferencing and creating spreadsheets. 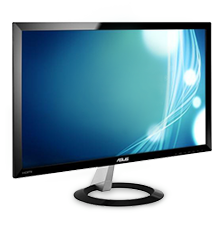 An LED or IPS monitor (see Display Types section) with Full HD resolution works well for multipurpose use. If you get a larger monitor (27" and up) or touchscreen monitor, it can double as your home entertainment center. 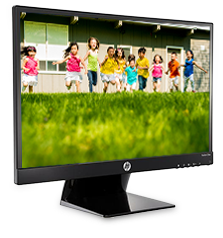 Photographers, graphic designers, video production artists and other multimedia professionals need a monitor designed for content creation. This means a larger screen with at least Full HD or Quad HD resolution for more screen space and highly detailed images. Also, you can't go wrong with an IPS panel with its deep blacks, accurate colors and wide viewing angles. If you're editing movies and videos, look for a monitor with a response time of 5ms or less, to reduce motion blur and ghosting, a faint trail left on the screen from previous images. You might also consider getting an adjustable stand or dual-display mount for easy, ergonomic viewing. Gamers need a monitor that can keep up with the speed and intensity of today's games. We recommend at least Full HD resolution, a response time of 5 ms or faster, a refresh rate of 60Hz or faster, and a horizontal viewing angle of 178° or more. Monitors incorporating NVIDIA G-SYNC or AMD FreeSync technology will work with any PC, but give you added benefits when paired with a compatible NVIDIA or AMD graphics card; together, they synchronize the refresh rate between the GPU and the display for smooth gameplay. If you enjoy dual boxing, add a second monitor to your gaming setup for a great view of each character's screen at the same time. IPS (in-plane switching) monitors deliver deeper blacks and more accurate color than most LED or LCD monitors, making them great for photo editing, graphics work and gaming. They also offer wider-viewing angles, so the picture looks exceptional even when you're not sitting directly in front of it. LED (light-emitting diode) monitors provide excellent overall picture quality. They produce brighter images and require less power than traditional LCD monitors, and they usually have thinner designs. Monitors in this category are still LCDs, but they have advanced LED backlighting. LCD (liquid-crystal display) monitors provide quality performance, usually at an affordable price. They use liquid crystals to relay what you see on the screen, and they are usually backlit by CCFLs (cold cathode fluorescent lamps). 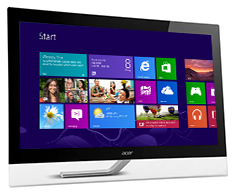 Touchscreen monitors are popular for home entertainment and multipurpose use. You can swipe through photos, play touch-based games and tap tiles to launch apps. If you go the touchscreen route, look for one with edge-to-edge glass for easy swiping and an adjustable stand, so you can move easily from work to movies to games. Just like TVs, monitor screen size is measured diagonally. As the screen size goes up, usually so does the price, so consider how much space you have as well as how much you want to spend. These reasonably priced monitors deliver quality performance for viewing email, sharing photos, using MS Office applications and surfing the web. Anything in this range will be great for multipurpose home and office use. Watch movies and TV shows, play games and view multiple-page documents. Monitors this size offer a bigger viewing area for serious gamers and professionals in photography, graphic arts and video production. Today almost all monitors are widescreen monitors, which are better for viewing large spreadsheets, having multiple apps open at the same time and keeping your desktop's sidebar open while searching the web. They're also perfect for movies and gaming. Widescreen monitors have a 16:9 or 16:10 aspect ratio, a measurement of the width of a screen compared to its height. Ultrawide monitors, first introduced in 2013, have a 21:9 aspect ratio. They make it easier than ever to view multiple documents at the same time or place multiple browsers side by side. Some ultrawide models come with split-screen software that lets you arrange your content on the screen in different ways. Ultrawide monitors also offer an incredibly immersive gaming experience. HD and HD+ resolutions, available on 15"–20" monitors, provide a quality picture at affordable prices. 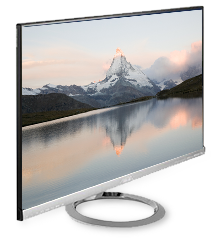 Full high definition monitors have a resolution equivalent to 1080p HDTVs. The crystal-clear picture is great for both everyday use and watching movies and videos. Also known as QHD, Wide Quad HD or WQHD, this technology gives you four times as many pixels as 720p HD. It delivers extraordinary image clarity, ideal for demanding applications like CAD, graphic design and professional photo and video editing. Sometimes called 4K or UHD, 4K Ultra HD is the best resolution currently available. With four times as many pixels as Full HD, it delivers immersive gaming, high-resolution photo and video editing and a lot more space for multi-tasking. It's great for gamers, graphics pros and movie fans who want to see the finest detail. Movie fans and gamers, before you buy, check to see what 4K content is available. Does your graphics card need to be updated? Make sure your computer can support your new monitor, especially if you're upgrading to Quad HD or 4K Ultra HD. If you buy a top-of-the-line monitor but have an older computer, you won't have the best picture quality. Check the monitor's hardware requirements to see if your computer or graphics card needs to be updated. What's a refresh rate? Does brightness level matter? We've compiled a short glossary of terms you may run into while searching for a monitor. Brightness level is important if you will be using your monitor in a sunny or brightly lit room. A typical brightness level for monitors is 250 cd/m2 (candelas per meter squared), sometimes displayed as 250 nits. But, if you're planning on using your monitor in a sun-filled room, look for one with a brightness level of 350 cd/m2 or higher. Sometimes called dynamic contrast ratio or mega contrast ratio, this is the difference between the screen's whitest white and deepest black. Manufacturers measure this in different ways, so it's not a reliable comparison. Refresh rate is how many times per second your computer refreshes the image onscreen. Most monitors have a 60Hz refresh rate, which means a new image is generated 60 times per second. Faster refresh rates reduce motion blur, so the higher the number, the smoother your picture will be. If you're a gamer, look for a refresh rate of 144Hz or faster. Measured in milliseconds, response time refers to how long it takes for a pixel to change its color, or essentially, how fast the screen can change its image. Superfast response times such as 2 ms or less, reduce ghosting, a faint trail left on the screen from a previous image, and blur in fast-moving movies and games. If you're sitting at an angle, instead of directly in front of your monitor, do you notice that the colors of the picture tend to wash out or change? Horizontal and vertical viewing angles tell you how far from center you can view the screen before the picture quality degrades. If you plan to view photos or play games with a crowd, choose a monitor with a viewing angle of 178° or higher. Check the monitor's ports and connections, not only for hooking it up to your PC, but also for plugging in your smartphone, camera, Blu-ray player, camcorder or other devices. Most computer monitors have HDMI, which carries both video and audio signals. It's excellent for playing HD content from your computer, gaming console, Blu-ray player and other devices. The best choice for very high resolutions and frame rates, DisplayPort connectors carry both video and audio signals like HDMI. But while HDMI can only carry 4K Ultra HD at 30 fps (frames per second), DisplayPort can handle this resolution at 60 fps, giving you a much smoother picture for fast-moving games and movies. DVI connections provide a video signal similar to HDMI, but they usually do not carry audio. The resolution they support varies. Some types of DVI connections can carry 1920 x 1200 resolution, while other types can carry more. While HDMI, DVI and DisplayPort are all digital connections, VGA is the old analog technology. It can carry fairly high resolutions and frame rates, but you won't get the crystal clear images that you do with DVI. With USB ports on your monitor, you can plug in your smartphone, digital camera, Blu-ray player, camcorder or other devices, and view content on your monitor without turning on your computer. If you plan to mount your monitor to a desk or the wall, look for one that's VESA compliant. This means the monitor has an industry-standard hole pattern or mounting pattern on the back. Compare the weight and VESA pattern of the monitor to the weight and VESA pattern supported by the mount to make sure they are compatible. Built-in webcams — For videochats with family and friends or videoconferences with colleagues. Speakers — Not all monitors have built-in speakers, so add this to your checklist if you plan to use your monitor for Skype, watching videos, listening to your tunes and other audio activities. You can also buy speakers separately. Dual-monitor stands — Lets you dock two monitors on one stand for multitasking or viewing spreadsheets side by side. Ergonomic features — Look for monitors and stands with adjustable features, like tilt and swivel functionality, monitor height adjustment and pivot adjustment, which lets you rotate the monitor to portrait position. Find a wide variety of monitors on BestBuy.com. Your local Best Buy store also has a wide selection of monitors to choose from. Plus, our friendly Blue Shirts are there to answer questions and help with choosing the best monitor for your needs.